Detail Itinerary : On arrival in Delhi you will be picked up from the airport and driven straight away to Samode. On arrival check in into Hotel Samode Palace. 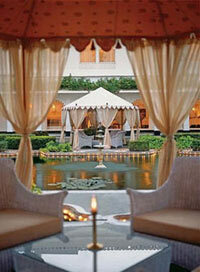 Afternoon free to explore the surroundings, in the evening enjoy GALA welcome dinner with traditional Rajasthani dances. Detail Itinerary : In the morning take a city tour of Jaipur covering Amer Fort, Royal observatory, and then continue to Nawalgarh: The heart of Shekhawati. On arrival check in into Hotel Roop Niwas Palace. Detail Itinerary : Morning free to explore the surroundings, then drive to Mandawa, ideal location to revisit Rajasthan’s rich heritage and culture. On arrival check in into Castle Mandawa. Rest of the day free to explore the surroundings. Detail Itinerary : In the morning explore the area, and in the afternoon drive to Bikaner. On arrival check in into hotel Lallgarh Palace. Detail Itinerary : Today enjoy city tour covering Junagadh Fort – constructed between 1588 and 1593 by Raja Rai Singh, fort has a 986 metre long wall with 37 bastions & two entrances, Bhand Sagar Temple – The 16th century Jain temple,is the most important of this temple complex, Camel Breeding Farm – a unique experience where you can ride on a camel & have perhaps the first taste of camel’s milk. Overnight at hotel. Detail Itinerary : Morning drive to Jaisalmer – The Citadel City, on arrival check in into Hotel. Afternoon free to relax or enjoy the city atmosphere. Detail Itinerary : Morning city tour covering : Jaisalmer Fort – built on the highest point of the Tricuta hill, the fort is entered through the Suraj Pol or Sun Gate. Outstanding features are Megh Durbar & various temples, Salim Singh- Ki- Haveli & Patwon–Ki-Haveli – some of the beautiful mansions with stone carving and lattice work of breath taking intricacy, Lodurva – A masterpiece of architectural grandeur. Overnight at hotel. Detail Itinerary : No trip to Jaisalmer is complete with out a visit to the most picturesque dunes. This day you will visit Sam Sand dunes. The ripples on the wind-caressed dunes create enchanting mirages. Adventure freaks can go out on a Camel Safari - getting the real feel of the desert on the camel back. Detail Itinerary : Today we drive to Jodhpur, after a short city tour proceed further to the Hotel Saradar Samand Palace, which is located near the Saradar Samand Lake. Detail Itinerary : In the morning you are free to explore the enchanting surroundings. On arrival check in into Ghanerao Castle. Detail Itinerary : In the morning take an excursion to Kumbhalgarh. Afternoon drive to Ranakpur, On arrival check in into hotel Maharani Bagh. Detail Itinerary : In the morning enjoy visit Ranakpur temples, then continue to Udaipur. On arrival check in into Hotel Shiv Niwas Palace. In the afternoon enjoy a city tour. Detail Itinerary : In the morning half day city tour. Then drive to Deogarh. On arrival check into Deogarh Mahal: A castle of Medieval Rajasthan. You can also enjoy of your choice Trekking in the hills or Walk in the village or Local tribal warrior dance or Performance by folk musicians and artists. Detail Itinerary : In the morning drive to Jaipur and proceed 15 kms further towards east. Arrive and check into Royal Castle Kanota : Rest of the day free. Detail Itinerary : Today drive to Agra, enroute visiting Fatehpur Sikri. Arrive and check in into hotel. In the afternoon enjoy a city tour covering Taj Mahal, Red Fort, The Tomb of Itmad-ud-Daula. Detail Itinerary : Today morning drive back to Delhi enroute visiting Sikandara. After a whirlwind city tour of Delhi, enjoy farewell dinner, and be transferred to Airport to board International flight.